Since the publication of the previous editions of the Handbook of Photosynthesis, many new ideas on photosynthesis have emerged in the past decade that have drawn the attention of experts and researchers on the subject as well as interest from individuals in other disciplines. Updated to include 37 original chapters and making extensive revisions to the chapters that have been retained, 90% of the material in this edition is entirely new. With contributions from over 100 authors from around the globe, this book covers the most recent important research findings. It details all photosynthetic factors and processes under normal and stressful conditions, explores the relationship between photosynthesis and other plant physiological processes, and relates photosynthesis to plant production and crop yields. The third edition also presents an extensive new section on the molecular aspects of photosynthesis, focusing on photosystems, photosynthetic enzymes, and genes. New chapters on photosynthesis in lower and monocellular plants as well as in higher plants are included in this section. The book also addresses growing concerns about excessive levels and high accumulation rates of carbon dioxide due to industrialization. It considers plant species with the most efficient photosynthetic pathways that can help improve the balance of oxygen and carbon dioxide in the atmosphere. Completely overhauled from its bestselling predecessors, the Handbook of Photosynthesis, Third Edition provides a nearly entirely new source on the subject that is both comprehensive and timely. It continues to fill the need for an authoritative and exhaustive resource by assembling a global team of experts to provide thorough coverage of the subject while focusing on finding solutions to relevant contemporary issues related to the field. Compiled and edited by Mohammad Pessarakli, a professor at the University of Arizona, School of Plant Sciences. 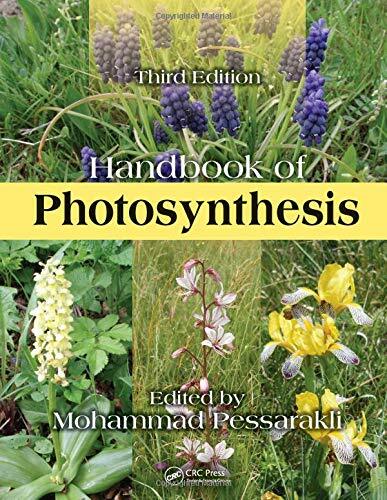 This newly revised, updated, and expanded third edition includes many new ideas on photosynthesis that have emerged in the past decade, and which have drawn the attention of experts and researchers on the subject as well as interest from individuals in other disciplines. This new edition of the "Handbook of Photosynthesis" has now includes 37 original chapters and making extensive revisions to the chapters that have been retained, 90% of the material in this edition is entirely new. The "Handbook of Photosynthesis" covers the most recent important research findings. It explores the relationship between photosynthesis and other plant physiological processes, and relates photosynthesis to plant production and crop yields. The "Handbook of Photosynthesis" also addresses growing concerns about excessive levels and high accumulation rates of carbon dioxide due to industrialization. It considers plant species with the most efficient photosynthetic pathways that can help improve the balance of oxygen and carbon dioxide in the atmosphere. Essentially, the "Handbook of Photosynthesis", provides a nearly entirely new source on the subject that is both comprehensive and timely. It continues to fill the need for an authoritative and exhaustive resource by assembling a global team of experts to provide thorough coverage of the subject while focusing on finding solutions to relevant contemporary issues related to the field. The "Handbook of Photosynthesis" is a standard and successful textbook on the subject and with all the new data provided, will continue to be a critically important and comprehensive foundation of a college level Agricultural Studies curriculum on photosynthesis. While a 'must' for college and library Agricultural Studies collections, it should be noted for the personal reading lists of students and non-specialist general readers.